Everyone who has come into contact with me as of late will know that this is an old eating excursion. This is because I have been “dieting” (and I use that term loosely) for a few weeks and have been avoiding bread, pasta, rice…anything starchy. It’s sad, but it’s BAM (Bathing suit Awareness Month). It’s been BAM for a while, but I have been pretty busy and haven’t had time to post this, so here are some bites from My Last Supper (or Last Brunch) at Locanda Verde. It was…everything I wanted for my last carbo-loaded experience. 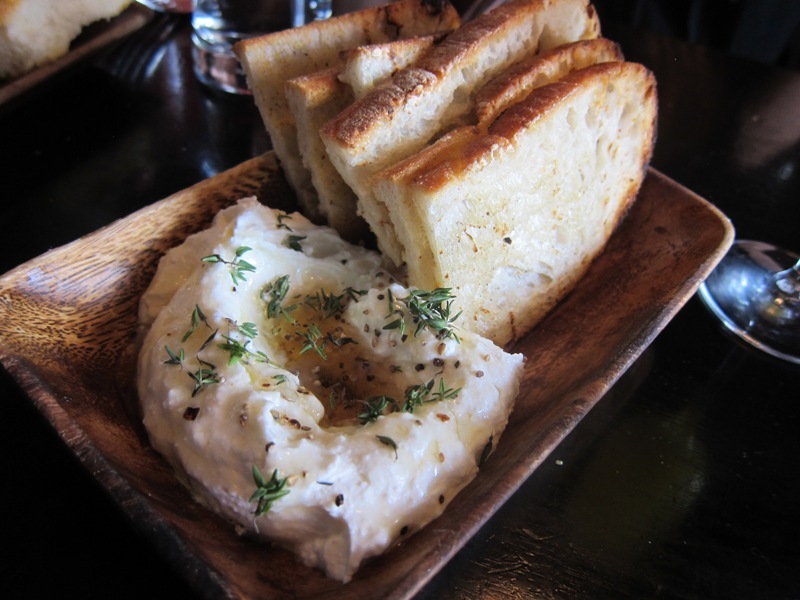 Burnt Orange Toast with ricotta, thyme, and honey. There is something so magical about the combination of thyme and honey, I can’t get enough of it. It’s sweet, aromatic, and delicious on this toast that had the slightest hint of orange. I’m not sure how they accomplished that – I’m assuming it was orange zest – but who knows. It was awesome either way. Pastry Basket of the Day. 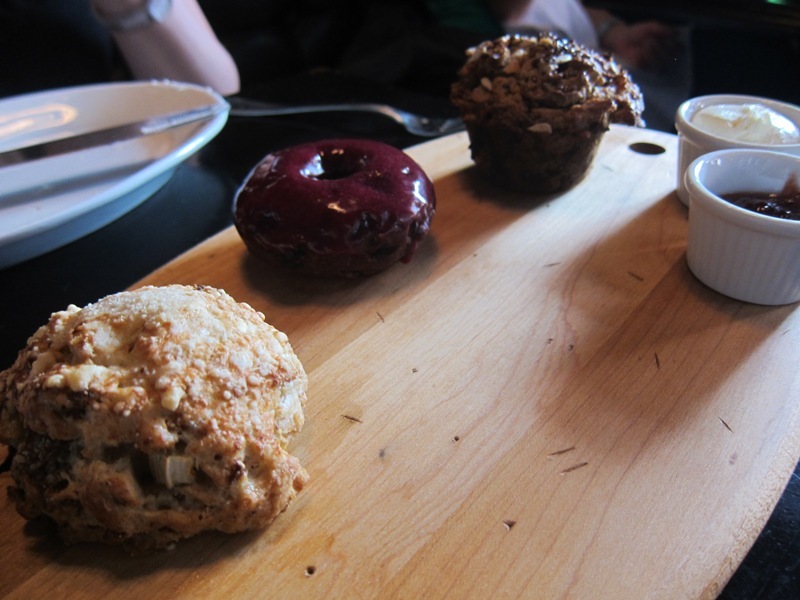 This came highly recommended by many of my friends, so when you are on a mission to carbo-load, this is the thing to order: Blueberry Cake Doughnut, Sausage and Fennel Scone, Morning Muffin. I put those in order of deliciousness, by the way. The Morning Muffin is not very descriptive, but it was of the multigrain, cranberry variety. All good by me. Carbo-loading presentation at its finest. Scampi and Grits. Here’s something you can eat that doesn’t have a ton of carbs! Hooray! 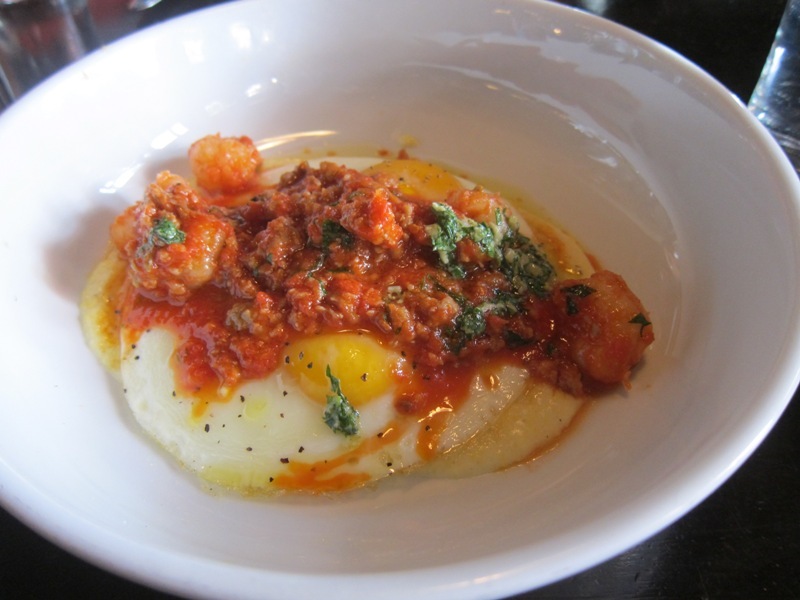 Small pieces of shrimp, sweet sausage in tomato sauce, organic polenta, and sunny side up eggs. When you break the yolk and let it pool into the creamy polenta, it looks like a work of art. Swirl it together and get a little bite of everything…it’s worth every. single. bite. Lemon Ricotta Pancakes. These have to be some of the best pancakes I’ve ever had; the sweet and tart mixture makes for an incredibly fluffy pancake, and they’re topped with blueberries and meyer lemon curd. The meyer lemon curd might sound gross if you don’t know what it is, but it’s a thick, creamy mixture that’s like lemons and sugar made into a cream. Doesn’t that sound delicious? Yes, yes it does. If you want to get into brunch at Locanda Verde, I suggest making a reservation at least a week in advance. At LEAST. This place books up fast (because it’s delicious) so definitely don’t wait. It’s the perfect spot for brunch with good friends and fam, a date, or even a working brunch. But who wants to work at brunch? Bites From The Great Googa Mooga! 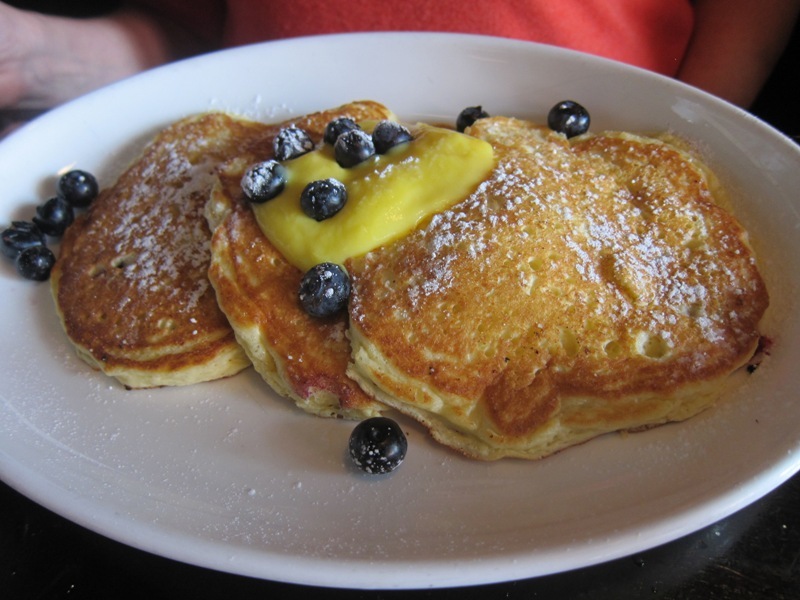 Honestly, the Lemon Ricotta Pancakes are making me drool right now. I definitely need to try this place out.